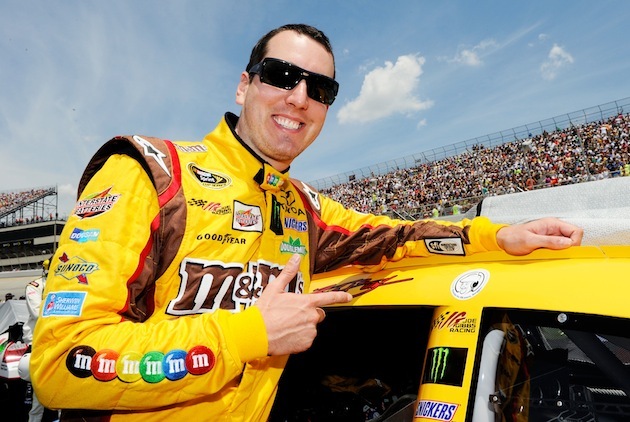 Kyle Busch took advantage of the misfortune of Kasey Kahne and Clint Bowyer and won the 8th annual Feed the Children Prelude to the Dream at Eldora Speedway on Wednesday night, outrunning race host and organizer Tony Stewart over the final 16 laps. If you were a Sprint Cup Series fan who found yourself wondering how much you would pay for a caution flag at certain points during the season's first 13 races, you certainly got your money's worth if you bought the late model dirt-track charity race on Pay-Per-View. The first half of the 40 lap feature was marred by caution after caution, including an eight car crash on the frontstretch on the third scored lap. Kahne started on the pole and relinquished the lead to Bowyer, last year's winner, on lap 13. When Kahne went to get the lead back from Bowyer just a few laps later, he slid up into Bowyer's car trying to clear him. The contact sent Bowyer's car into the wall, and eventually into the garage after he got into the wall again on the next lap. Those events handed the lead to Busch, who started first with 16 laps to go and never relinquished the lead. By the time Stewart had moved from fifth to second, Busch already had an insurmountable advantage. Danica Patrick, who drives for Stewart in the Sprint Cup Series, turned the first laps of her professional driving career on dirt on Wednesday. Patrick hit the wall during her heat race before the main feature and finished three laps down in 15th during the feature race. Kurt Busch, suspended by NASCAR for Sunday's race at Pocono, was entered in the event and started on the pole for the fourth heat race before the feature but was caught up in two incidents in the heat race. The damage to his car was severe enough that he was unable to race in the main event. Full results are below. Each of the race's top 10 finishers will have a food truck donated for Feed the Children in the city of their choice.